Today, when you order "Shock Lemonade Can", you'll instantly be emailed a Penguin Magic gift certificate. You can spend it on anything you like at Penguin, just like cash. Just complete your order as normal, and within seconds you'll get an email with your gift certificate. 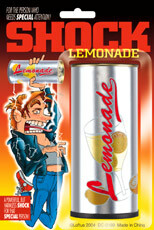 Shock Lemonade Can Delivers a powerful JOLT, when all they wanted was a sip. Offer someone a drink and watch the fun happen for you. This authentic-looking can emits a powerful, but harmless, shock. This delivers a powerful zap. There were probably isn't that great it is obvious that it is not a normal can. Be prepared to run if someone actually gets zapped. They may bounce the can off your head.